We offer a wide range of plants and hardgoods to meet all of your home lawn, landscape, and garden needs. We select varieties that are perfect for our region. Our wide selection ranges from shade trees with brilliant fall colors to flowering ornamental trees either of which will add beauty and value to your home. Select from a large inventory of shrubs to fit your specific landscaping need…sun, shade, evergreen, flowering…we have them all. Shrubs fulfill many functions in your landscape from foundation plantings, privacy borders to mass plantings. We carry many common as well as unique, hard-to-find varieties. A pallet of colors that can last throughout the changing seasons is what you will find in our perennial department. We carry a huge selection of sun and shade perennials. Stop by our Garden Center to check out our new arrivals. Our seasonal selection of annuals and herbs are perfectly suited for southern Illinois and includes all colors and sizes. Our annuals come in a variety of sizes from 4” through 10” pots. We also provide a potting service and can create an instant, eye-catching planter for your patio. You can do your own planting, or let us do the work for you! With direct shipments from tropical greenhouses in Florida, we offer a great selection at great prices. We regularly carry air plants, succulents, orchids, African violets, ferns, ficus and more. Use the color and texture of houseplants to brighten up your patio during the warm seasons or throughout your home all year long. Beautiful glazed ceramic, durable resin, and classic terracotta are several of the types of pottery we have available. Be the envy of your neighbors this year when you place your flowering annuals in a striking glazed ceramic pot by your front door! Don’t forget about a simple classic terracotta pot, which are great for geraniums and other plants that can withstand high heat and drought. 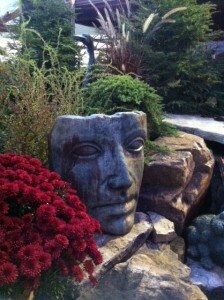 Beautiful imported fountains and statues can be found throughout our Garden Center. If you are shopping for a fountain, we have many already running so you can take in the full effect before you purchase. We also sell fountain pumps and other accessories. In addition to fountains, we also carry glazed ceramic birdbaths, garden benches, garden faces, outdoor weather proof art and statues. We have a lovely, unique selection!